When someone is new to the company, team or project, it’s important to make them feel welcome. Jennifer Bridges, PMP, shows you how to incorporate new people and get them contributing quickly . You’ve either been the new person or have had a new individual introduced to your company, team or project. It can be an awkward transition. Sharing your work management tools and office culture can be a lot to handle. Jennifer noted that whatever the scenario, the addition of a new body to an organization can be a complex dance. People need to get to know one another and feel comfortable so they can work together efficiently. Some people are naturals in such situations, but others might be less social and need an opening to feel that they’re part of the team. Jennifer offered these seven suggestions to help facilitate that process. Send out a welcome card, letter, package or even an email to express how you’re looking forward to working with the person. Show you appreciate them. There’s nothing worse than landing a new position and being ignored, even if that’s because others are deep in their tasks. By taking the time to acknowledge the presence of a new person and making them feel welcome, you help them feel comfortable and boost productivity by getting everyone working together faster. Welcome them on their start date, too, and be excited doing it. Tell them you’ve been looking forward to meeting them. Take a moment from the day to greet the new person; have the whole team do so, even the whole company, if possible. Showing that you know that they’re new, and that you’re there to help, is good for them and the company’s bottom line. Ignoring them can lead to resentment or at least a longer transition for the new person. Read more about conflict resolution strategies here. Introduce the new person to the company, team or project. In so doing, don’t just say who they are; try to get a little deeper. Mention something specific about them, such as how they are bringing value to the company, team or project. Put the new person in context, and explain why they’re there and how come everyone should be excited and happy to have them. Have a welcome gathering. Inviting the person to coffee, having a lunch with them or some other nonwork-related event is a great way to break the ice in a social and less stressful environment. Meet with them to review roles, responsibilities and expectations. While this is more of an official welcome, it’s an important one. It lets the new employee know what’s expected of them and the context in which they’ll be working. This is a good time to cover the company handbook with them, so they can learn about the company, what it does and what it stands for. Providing training and giving support is also key, as the new employee might not be up to speed on the technology used in the office. Spending time beforehand to get the new person trained in the project tools you use will save time afterwards when you’re deep in a project. It’ll also create a bonding experience for them and you. Give them a plan, sort of like their marching orders, so they know what to do. But don’t just leave it at that. Take the time to follow up and ask how they’re doing. If they need more help or direction, give it to them. Again, this is a way to make sure work is done correctly and it builds personal bonds. Pro-Tip: If the new person is in charge of you, like a boss or manager, there are also ways to make them feel welcome and at the same time make a good impression on your new boss. First, of course, is to do you job. But there are many other things you can do to understand how the new boss communicates and how to work well within their expectations. 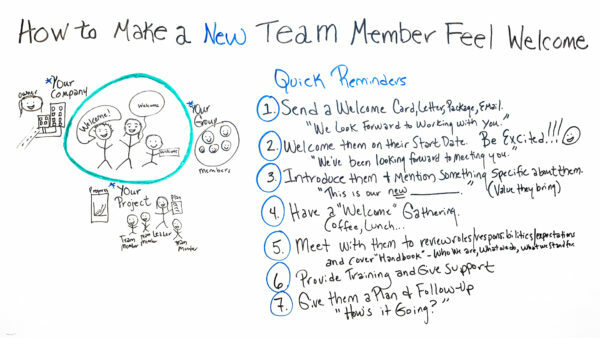 Today, we’re talking about how to make a new team member feel welcome. This is so important. And there are different scenarios where this applies. Could be someone coming in new to your company, maybe someone new to your group, or even new to your project. So here are a few quick reminders and tips for your new member. Also, number three, introduce them and mention something specific about them, about the value they bring. Maybe something like, “Hey, this is our new software developer,” or “This is our new rocket scientist,” so people know who they are and what they’re bringing to the table. Well, you could schedule a call and let people visually see, maybe have a video call these days, and just have people on the team be there, so they can see one another and just introduce. Also, meet with them to review their roles and responsibilities, expectations. Hopefully, you’ve covered them before they start. But it’s good just to sit down and have them go over what they’re expected to do. And also, cover the handbook that includes who we are, what we do, and what we stand for, so they know more about either your company, your group, or your project. Then also, provide any kind of training they may need. There may be something on the policies or something regarding the project or even the company. And give them support and just make sure they understand. I know sometimes whether it’s been a new company that I’m working with, a new client, a group, or even a project, sometimes just the new information and all the new names and faces can be overwhelming. So providing that support is very special too. And then number seven, give them a plan. Everybody needs a plan. It makes them feel secure and confident about what they’re supposed to do. And then, continue to follow-up and just ask them, “Hey, how’s it going?” just to make sure they feel comfortable, they understand where to be and what they’re supposed to do. So these are a few quick reminders and tips. And if you need additional information on how to welcome your new team member, then sign up for our software now at ProjectManager.com.